Nonstick cookware goes bad. Not in the sense of that rotten tomato lurking in the back of your fridge, more like the coating just wears off after so many uses. Other than scraping the surface with metallic utensils, there is another common way to hurry your cookware into the pan graveyard: by storing it. All nonstick pan owners are faced with a dilemma: Just where am I supposed to store this thing? You could put one on top of the other with the nonstick surfaces facing each other, thereby protecting the coating. 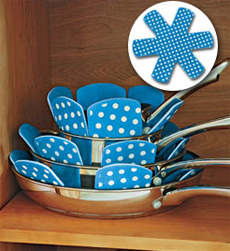 Or, another popular option is to just keep the nonstick pans on top of all the other cookware. However, at some point it’s time to get real. Other than a wall rack or hanging ceiling mount the best place for pots and pans is stacked right on top of each other. Right on top of each other, that is, with these Pan Protectors sandwiched in between.